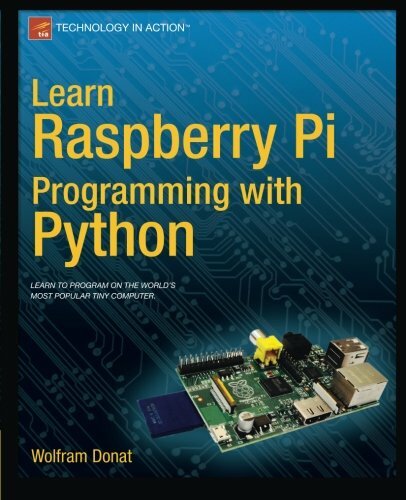 Learn Raspberry Pi Programming with Python will show you how to program your nifty new $35 computer to make a web spider, a weather station, a media server, and more. You'll learn how to program in Python on your Raspberry Pi with hands-on examples and fun projects. Even if you're completely new to programming in general, you'll figure out how to create a home security system, an underwater photography system, an RC plane with a camera, and even a near-space weather balloon with a camera. You'll learn how to make a variety of fun and even useful projects, from a web bot to search and download files to a toy to drive your pets insane. You'll even learn how to use Pi with Arduino as well as Pi with Gertboard, an expansion board with an onboard ATmega microcontroller. Readers who want to learn Python on a fun platform like the Pi and pick up some electronics skills along the way. No programming or Linux skill required, but a little experience with Linux will be helpful.